Panta Rhei is returning to Annapolis from the Caribbean 6/1/2018 +/-. 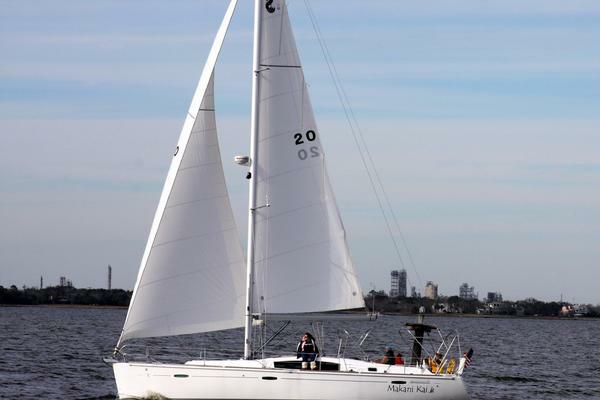 Smaller boat trades considered, power or sail. United Yacht Sales New Jersey would love to guide you through a personal showing of this 54' Grand Soleil 54 2008. This yacht for sale is located in Grenadines Grenada and priced at $595,000. For a showing please contact us by filling out the form on this page and we will get back to you shortly! This is the brand new Luca Brenta designed Grand Soleil 54', launched at the Genoa Boat Show this October and immediately voted "Yacht of the Year". The Grand Soleil 54' incorporates all the luxuries that are common to a custom yacht, but engineered and developed as a production, and therefore affordable yacht. In harmony with the current Grand Soleil range, the integral galvanised steel frame provides the structural heart of the yacht. With below deck "Reckman" furling, all lines lead aft and below deck, a standard "german" mainsheet system, also below deck, integral transom garage, this yacht is brimming with the most up-to-date features. All deck hatches are flush, hull windows provide increased natural light to all cabins, and the new "light oak" interior joinery exudes contemporary style and quality. At Cantiere del Pardo, maximum priority is given to the question of safety and structural strength. The galvanized steel grid, which is attached to the hull with a metal/acrylic chemical bond and further reinforced with a multiaxial cloth, provides stiffness and strength unheard of in laminated hull structures. The one piece grid structure is designed to uniformly distribute keel, mast and chain plate loads. This has the added advantage of lowering the C of G of the boat and also improving the stiffness of the hull thus providing the owner with superior sailing characteristics.